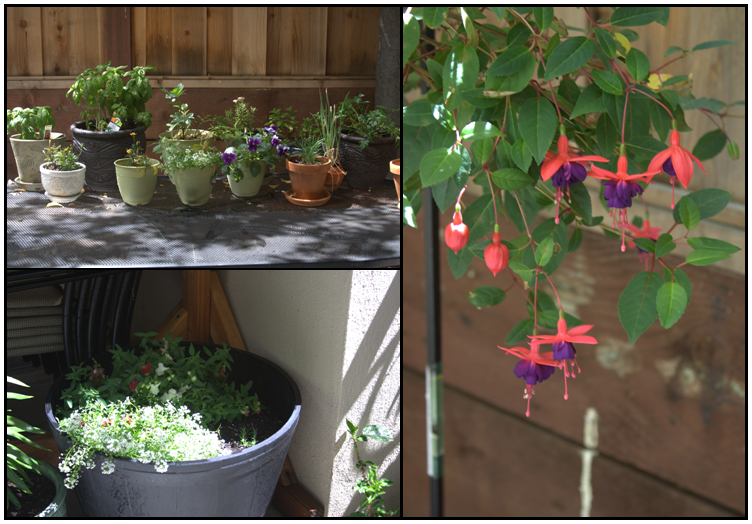 Last year, I decided that growing edible plants would be fun. Unfortunately, the aphids, spider mites, whiteflies, and squirrels decided that eating my plants would be equally fun. This year, with my mind set on defeating the evil squirrels and aphids, I put in a bit more effort, and so far, it seems to be paying off! Bottom left: you can just barely see the black flower barrel and next to it the green leaves of our hibiscus coming back. Middle left: vegetable cage. 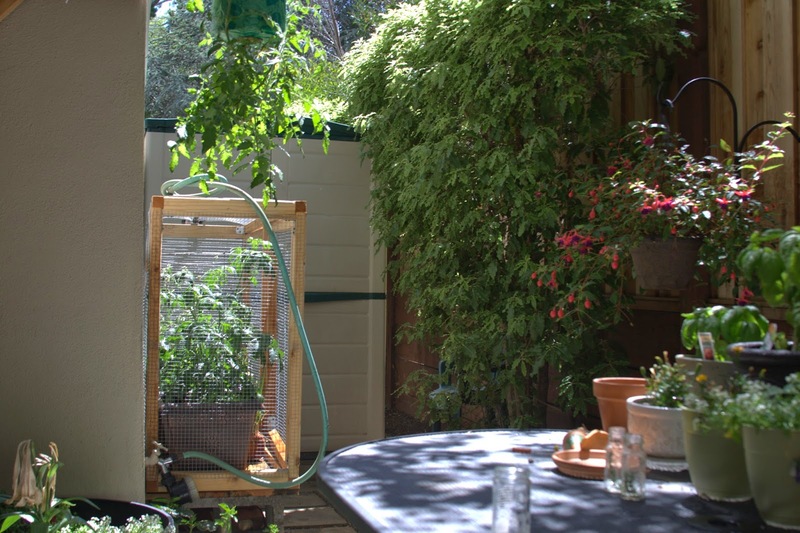 Top middle: hanging tomato plant. Top right: fusia basket. Bottom right: some of the herbs on our patio table. Firstly, I read up on aphids and other bugs. As it turns out, a natural way to control the bug populations in your plants is to plant a variety of edibles and flowers that create a sort of habitat. Rather than attracting a single bug (such as aphids), this habitat can also attract beneficial insects that prey on the harmful ones. Monoculture (planting only one plant) is a recipe for disease and bug infestation. Of course, not all plants love growing next to all others, so I used some helpful online sites to make choices. One of the predator-attracting flowers that has grown easiest for me this year is alyssum, a small white flower. Many brightly colored flowers attract other bugs, as well. And bonus: my fusia has attracted hummingbirds, which are just plain fun to watch! For lists of predator attracting flowers, read more here and here. with alyssum and snap dragons. Right: fusia flowers. All in all, we have significantly fewer aphids this year. 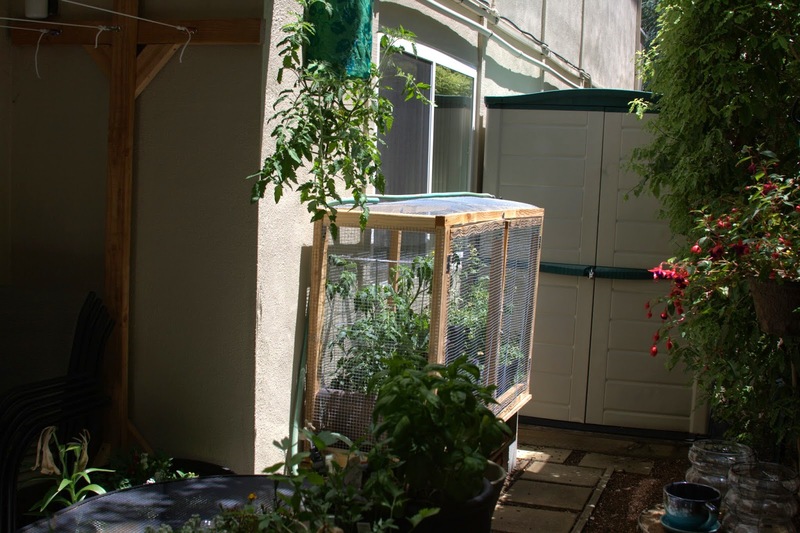 Vegetable cage with a tomato, bell peppers, chives, green onion, arugula, and several types of flowers. 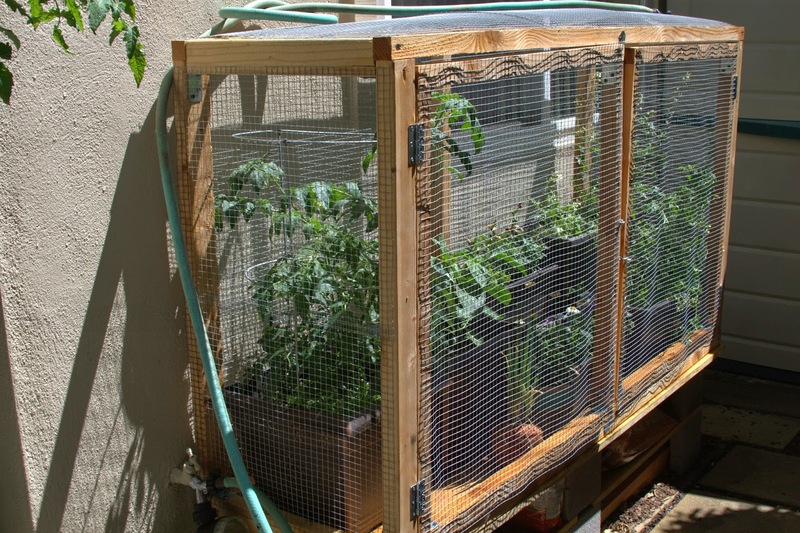 As for the squirrels, I designed a cage-like contraption with swinging doors, and so far, I have not had any whole heads of lettuce go missing. (Yes, that happened last year, when the heads were still too tiny for a human to want to eat; they were just pulled completely out of the pots, with nothing but a hole where a lettuce once had grown!) For the cage, I simply drew a rudimentary design on a piece of paper, and my husband and I wrote in some measurements. We bought the wood, metal brackets for the corners, wire fencing material, and other supplies and went to work! 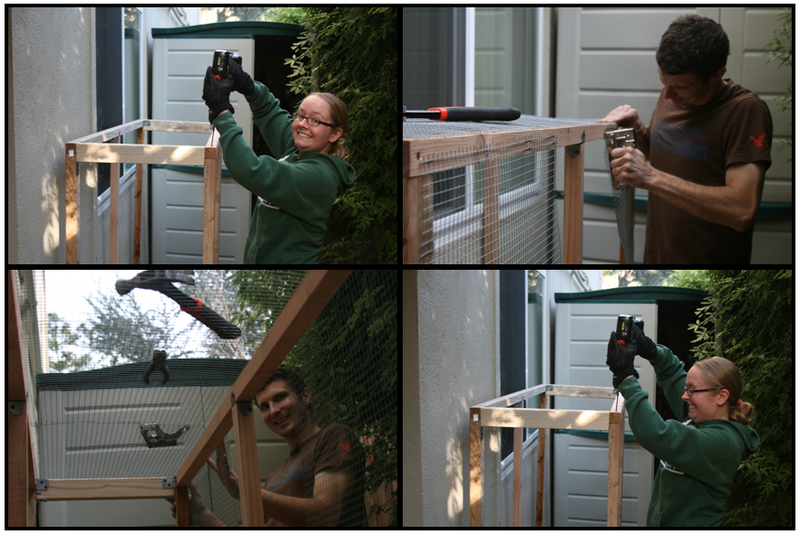 This was a three-weekend project for us between the shopping, building the frame, attaching the wiring, attaching the doors, etc. It was more work than I thought it would be (especially for my husband, as he did some of the heavier lifting), but I am very happy with the result! Our plants are looking great so far! This year, we have tomatoes, bell peppers, chives, green onions, arugula, basil, parsley, lovage, thyme, and rosemary, in addition to several species of flowers, such as marigolds, alyssum, pansies, snap dragons, Shasta daisies, a fusia basket, and the perennial hibiscus I planted last year (which is just starting to grow new leaves, so hopefully the flowers will come in again soon!) The veggie plants are getting quite large, and I hope that we get actual tomatoes and peppers in the near future. Hopefully I can post more pictures when we do. Another angle showing most of the garden. In the fall semester for my Theories of Health Behavior class, we spent some time talking about implicit associations. These are preferences or biases that we hold that we may not even know we hold and that have the potential to affect our choices and behaviors. One really interesting experiment we discussed involves the approach bias for alcohol (e.g. the tendency to either automatically approach/prefer or not prefer alcohol). In one study, participants' approach bias for alcohol was measured both before and after an intervention. The intervention involved asking alcoholics in recovery to use a joystick to either pull pictures towards themselves or to push them away. Four different groups were assigned to four different levels of intervention, with two being experimental groups and two acting as control groups. The first experimental group was directly told to push the joystick away when an image of alcohol came on the screen and to pull the joystick when a soft drink was displayed. All images were exactly square. 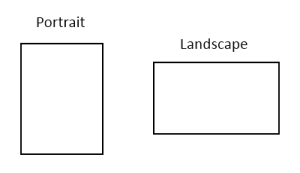 The second experimental group was told to push the joystick for pictures in landscape format (horizontal) and to pull the joystick for pictures in portrait format (vertical). 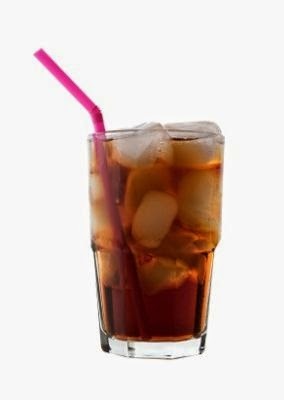 Most of the images of alcohol appeared in landscape format, whereas most pictures of soft drinks appeared in portrait format. However, participants were not told about the alcohol versus soft drink distinction and were merely told to react based on the layout orientation of the picture on the screen. As for the control groups, one group received no intervention at all. A second control group was told to push the joystick for pictures in landscape format (horizontal) and to pull pictures in portrait format (vertical). In this case, pictures of alcohol and soft drinks were evenly distributed between the landscape and portrait images, so that participants were pulling alcohol images the same number of times as they were pushing them away. 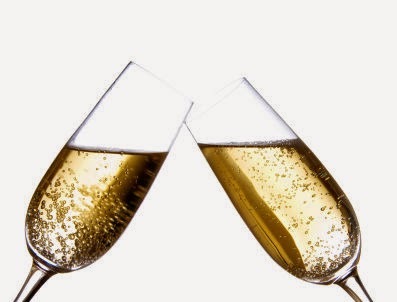 The results of the study showed that for both experimental groups, alcohol approach bias was changed to a strong avoidance bias immediately after the intervention. The control groups, on the only hand, averaged only a mild decrease in approach bias. Note that this was equally true in the case of individuals in the second experimental group, who were unaware that they were specifically pushing images of alcohol or that the exercise was meant to affect alcohol preferences in the first place. Furthermore, in a one-year follow-up, fewer of the experimental group participants had alcoholism relapses than the control group participants. On the downside, the experimental groups ended up showing an increased approach bias for soft drinks! A similar study was conducted among high-drinking students, who then taste-tested alcoholic and soft drink beverages after engaging in the joystick/image exercises. This study showed that those who had been assigned to unconsciously push away the images of alcohol and who also showed a change in their Approach Avoidance Test score, ended up drinking one full glass of beer less during the taste-testing time than those whose Approach Avoidance Test scores had not changed significantly. While these studies certainly raise some ethical concerns about unconscious brain manipulation, they also have the potential to affect addiction treatments. In addition to the health intervention reasons why these studies are interesting, I also found them interesting from a marketing perspective. Surely many companies who want to sell me something are also aware of the power of implicit associations and use these to their advantage. It has definitely got me wondering how my implicit preferences affect my food decisions and other consumer choices. In fact, some firms even use neuro-marketing to create the most compelling advertisements. These firms pay people to view advertisements while having their brain activity monitored, in order to predict whether the ads are likely to affect consumer preferences and behavior.....more on that in a later post! What do you think of the joystick activity as a potential alcohol intervention? What potential benefits or downsides seem most relevant or important to you?